Our perioperative apps can save up to $300 per inpatient surgical procedure. 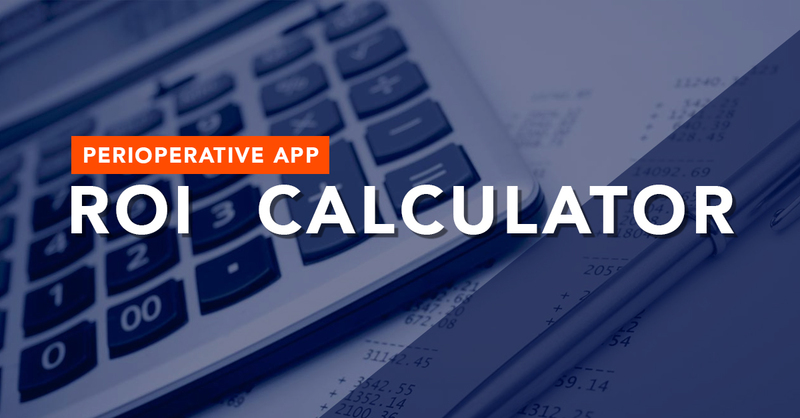 Use the ROI calculator to quickly estimate how much money your hospital could save annually. Enter the number of surgeries performed at your hospital annually. You may also change the rates and cost figures to match your own.
? The weighted average of same-day cancellation rates, representing a cross-section of ages and surgical procedures from eight different studies.
? The average cost to a hospital of a same-day surgical cancellation, based on the opportunity cost of lost OR time and lost revenue from surgeries that are never rescheduled.
? The rate by which hospitals can reduce same-day surgical cancellations when apps are implemented, based on the weighted average of two studies examining app usage and same-day cancellations.
? The weighted-average 30-day readmission rate, representing a cross-section gathered from 87 studies examining readmission rates for the 12 most-common surgical procedures in the U.S.
? The average cost to a hospital for a 30-day readmission, weighted by U.S. payer mix.
? The rate by which hospitals can reduce 30-day readmission rates when apps are implemented, based on clinical data examining increased health literacy and care coordination.